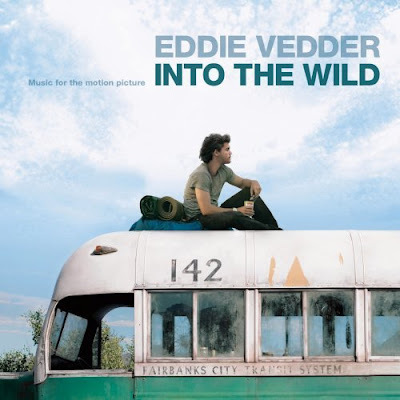 Clearly intended as a birthday gift for me (it's tomorrow), the first Eddie Vedder solo song from the Into The Wild soundtrack has now been posted on the Into The Wild website. This initial listen sounds well-suited to what I understand the movie is about (note to self: get the book!) -- a journey into the great wide open, wanderlust, sweeping vistas, solo strength. It builds from an organic acoustic/tambourine affair to a heavier, fuzzier, driving thing of beauty by the end. It is apparently a cover of an obscure song by Canadian musician Gordon Peterson under the name Indio, from the 1989 album Big Harvest. Searching for information on Peterson is near impossible, as he seems to have all but vanished since the album was released, but the original song apparently features backing vocals from Joni Mitchell. Ed's version ramps up the Middle-Eastern influences and reminds me of Pearl Jam songs like "Who You Are" or "Face of Love," a bit exotic. Sleater-Kinney punk goddess Corin Tucker duets, taking the part that Joni filled 18 years ago. The soundtrack album of solo material from Eddie Vedder will be coming out one month from today on J Records, and the Sean-Penn-directed movie opens in U.S. theatres on September 21. I haven't even listened in the car yet, but I can already tell this is destined to become one of my all-time favorite driving songs. This sounds great. Thanks for posting the song. I'll definitely get the soundtrack, and listening to the song made me curious about the film too. Happy birthday - looking forward to this film and the soundtrack. Thanks for the slice of cake! 2. Definitely pick up the book. It's one of the most bizarre stories about survival you will ever come across. Happy Birthday Heather, your blog is one of the best on the net. Thank you so much for posting this - I can't wait to buy the soundtrack! And have an awesome birthday!! Happy Birthday, Heather! Great site! happy birthday. and thanks for the song. i can't wait for this movie to come out, it's one of my favorite books. be well. First of all Heather, Happy B-Day. Second, I had no idea that they were making this book into a movie. It is an outstanding book. I highly recommend it. I am unsure how it will be as a movie although I am usually pretty skeptical about those things. This may sound like a 'Noob' blogger question, but how to you embed those play buttons for the mp3's? NICE. I've been waiting for this song since I first saw the tracklisting, I've missed Corin desperately since S-K decided to take a break. I know she's only doing backing vocals, but it's so nice to hear her voice anyway. Thank you thank you. And I hope you have a fantastic birthday as well! Great site Heather, I'm happy I found it. There is a much better version of this song I hear on the radio up here in Canada from time to time and it blows away the acoustic version you linked on youtube. The Vedder/Tucker version is fantastic of course and thanks again! I gave the song a spin being the big PJ fan that I am and then thought, "I know this song" I looked at the Amazon link and recognized the cover from back in my radio days (we played it a vinyl when we first got it at the radio station--CD versions usually came in a couple of weeks later) Not to date myself TOO much, but 1989 was a great year to work at a "modern rock" station back in the day, and the original "Hard Sun" was part of that. I LOVED this book. It sat with me a long time after I finished it. I saw a trailer for it recently, and got all excited. I also do love this site. Happy birthday! Thanks so much for letting us know about the movie. I love the book and had no idea that it was being made into a movie. The music they are playing on the site sounds great. I can't wait to hear the soundtrack. There is an article in Esquire mag this month with Sean Penn - it talks a lot about this movie (Sean Penn, directed it), and it does sound like the movie will be really good. They mention Vedder briefly in the article, that his soundtrack is "an open road opera" and it refers to his "jet engine roar" helping give goosebumps during certain moments in the film. Hope you had a good birthday, HB. Amazing song, thanks for sharing!! she already mentioned the version up here is Indios original from which eddie covers. great song, it is in my collection since day one. just to clarify, there is actually a better Indio version than the youtube one she posted. Joni is much more involved and it's a more powerful version. unreal how it's so hard to find online though. canadian radio plays the version i'm referring to from time to time. Happy Birthday - thanks for everything you share with all of us! I actually HAD that Indio album, I know this song. Excellent. I think the IntoTheWild.com site took it down. You can still stream it on their site. The book is damned great. Got it for a birthday present a few years ago. It's a stunning portrait of a willful "outsider" who goes to a romantic extreme most of us can only dream of, but pays the ultimate price. and a cautionary tale of human impotence and misadventure in the wilderness. Happy Birthday!!! And thanks for the many gifts (music, passion, great writing, attitude, etc. etc.) you share. You're almost a Virgo and that's alright with me. Absolute Vedder-concentrate goodness! This album and the movie are going to be exceptional, I feel. Great blog, I'll be back. Thanks Anon! Those are cool videos.